Thomas Bradley (1917-1998), who preferred “Tom” to the more formal name, was the first African American elected mayor of Los Angeles. He also holds the record for longest service, having been elected five times to the office. Born in Texas, Bradley came to Los Angeles at age seven, attended local public schools and UCLA, and joined the LAPD in 1941. When he was elected to the Los Angeles City Council in 1961, he retired from the LAPD with the rank of lieutenant. Bradley unsuccessfully challenged Sam Yorty in 1969, but returned four years later with a coalition of liberals, Jews, blacks, labor unions, and downtown business leaders. He also projected a vision of a Los Angeles with a revitalized center, connections to world trade, and an improved rapid-transit system. He defeated Yorty in 1973 and over the next twenty years did much to accomplish his vision. Among his triumphs were the city’s hosting the 1984 Olympics, a financial success that set a standard for other cities with Olympic aspirations. He also supported low-income housing projects built by the Community Redevelopment Agency. Under Bradley’s tenure, the complexion of local government changed as minorities and women found employment opportunities and advancement in working for the City of Los Angeles. Bradley had higher political ambitions, making two unsuccessful tries for the governor’s office and losing in 1982 and 1986 to George Deukmejian. His long tenure as mayor ended with mixed results, as in his last year of office when the Los Angeles Riot of 1992 broke out after the police officers who had beaten Rodney King were acquitted. When one ventures to comment upon a current biography, and particularly if a black person is the book’s subject, as is the case with Tom Bradley, the Impossible Dream, the reader definitely should keep in mind that, to a considerable extent, our society has improved in racial aspects since that person’s childhood. Tom Bradley, the boy, the youth, and the young man, competed within a racially far more difficult society than similarly ambitious young black people would tend to encounter these days. So the successive ordeals he confronted—and coped with—deserve to be multiplied or magnified at least ten times in comparison with what similar young men would be faced with today. In the time and social setting when Tom Bradley was growing up, it was no small achievement for a black person to acquire even a high school diploma, not to mention a college degree, and it would have been extremely foolish for that person to consider it possible to become the mayor of Los Angeles. My own presumption in accepting an invitation to provide the foreword to this book is that I have known Tom Bradley for over a decade. We were introduced by my manager Louis Blau, who earlier had expressed his belief that it was important for Los Angeles to elect Bradley as mayor. We did attend Bradley’s mayoral victory party within a few weeks. Subsequently, I have come to know the mayor on a more personal basis, and I have heard him discussed at length by others who know him as boss or friend, as political colleague or ally or adversary, or as foe or fan. 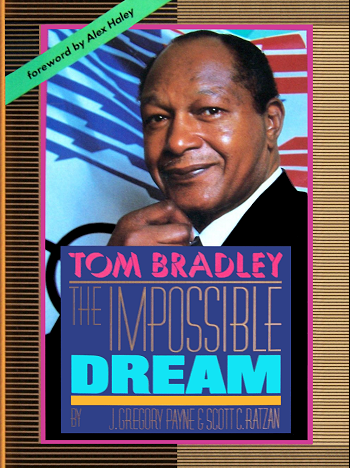 From my experience and knowledge of the man, I feel that the authors of this book have captured the essence of Tom Bradley, of his struggles to rise as a scholarly and ambitious young man, as a policeman, and as a young politician who has since become a veteran. Certainly one cornerstone that underlies Tom Bradley’s escalating political success was the impact of his early experiences with racism, not only against blacks but against other minorities as well. It was these experiences that instilled distaste for any form of ethnic polarization, regardless of the source or the target, and helped to develop his career trademark of serving not some but all of the people. As a mayor, he has clearly and definitely displayed, particularly to younger politicians, the wisdom, indeed the necessity, of developing and coalescing a broad-based constituency. Another of Tom Bradley’s cornerstones—a tradition that is frequent among a widely diverse range of black achievers—is that his early life was rooted strongly within the church. Significantly, the family church was where he and Ethel met and were married. Ethel was a beautician with a drive similar to Tom’s to get up and go and achieve something of herself. He was drawn to Ethel, not simply because she was pretty, but also because her strong desire for success approximated his own. Finally, the hard working mother of Tom Bradley supplied his anchor, with her constant encouragement, even when his dreams seemed ridiculously unattainable. The young athlete Tom Bradley symbolized the using of sports ability to increase opportunities beyond what he would have had otherwise, another black tradition both then and today. If you visit any American city’s black communities around sundown, every playground will contain scores of youthful basketballers getting in the loving last shots and agile body moves of that day, each and all of them fantasizing themselves to be some superstar or other such as Kareem or Moses or Magic or Dr. J. But unfortunately few among the local playgrounds’ stars realize that the higher odds for success depend upon applying comparable energy to academic pursuit, as young Tom Bradley seemed to know instinctively. As a policeman walking a beat, he talked himself hoarse trying to drum this into the heads of young blacks on the Los Angeles streets—even as his private dream was one day to be the first black mayor of that city. It is as a fellow author that I am able to see the major problem that the authors of this book faced and have dealt with as best they could. The authors ultimately found that not only is Tom Bradley characteristically the stoic and impassive politician, but that also has become his inherent style in almost any public interfacings. Politically this has proved to be a distinct positive, for time and again all those who know how Tom Bradley functions as a mayor are most aware that beneath his stoic surface there is a granite determination to accomplish his intended objectives. Even those who oppose and detract Tom Bradley, for political or personal reasons, still fully respect that he is a tough administrator who makes tough decisions and then makes them stick. But from an author’s point of view, an inherently impassive stoic can easily prove to be a difficult subject to write about—as this book sometimes reflects. For the biography, like its subject, tends to be impassive in its account of a man’s life with no storms, rarely a squall, and just a few ripples of emotion. This is due largely to the fact that Tom Bradley does not relish discussing his emotions. Nevertheless, the authors, being trained specialists, researched widely and ably, finally obtaining a mass of raw data, which they have kept categorized and focused to give the readers fresh insights into Mayor Tom Bradley. The authors’ discipline has kept this book from being just another volume of puffery or praises for its subject. For the story of Tom Bradley is told with an omnipresent critical examination of the famous and popular mayor, who is—and should be—one of the most important and studied political figures of our time. It candidly addresses how he met his challenges and his failures, and how he coped with his failures, usually managing ultimately to achieve what he had wanted. Overall, I am unaware of any other book that can afford a reader a better look at how a young black from a small southern town realizes the vital importance of gaining an education, and then—dreaming to achieve the seeming impossible—in his calm, stoic way, he incredibly does actually achieve much more than he previously had dared to dreamed. ~ Alex Haley.